After having written on the Jovian system in Space 1889, I began to wonder what a habitable satellite of a Jovian might be like. 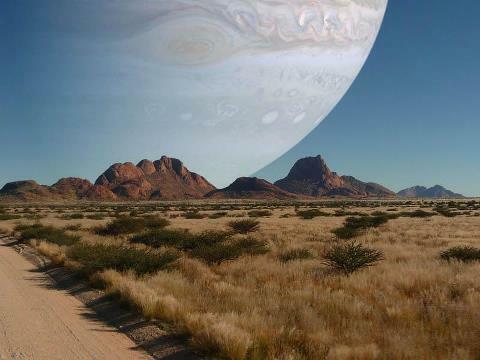 The jovian – from now on called Primary, would have to be in its star’s habitable zone ie about 1 AU from a Sun-like star. This is quite possible, it is now known that jovians can be quite close in to their sun, so one at 1AU in a circular orbit is not implausible. Could Primary have a satellite the size of Earth? The gas giants in our solar system have some quite large satellites, but they are all less than c. 5,000 kilometres in diameter. This is too small a sample from which to draw firm conclusions, however. Furthermore, it occurs to me that Primary, being so close to its star, would collect more rocky protoplanets that would form the building blocks of its satellite system. How far would satellite Earth be from Primary? About fifty years ago, Isaac Asimov wrote an essay entitled ‘Just Mooning Around’ in which he made the observation that natural satellites, as opposed to captured asteroids, are gravitationally attracted at least 30 times more by their primary than they are by the Sun. (One exception is Earth’s Moon, which is attracted more than twice as strongly by the Sun as Earth. Asimov suggested that the Earth-Moon system is best seen as two planets with interlocked orbits rather than a primary-satellite system). If we assume Primary is the size of Jupiter and the gravitational ratio is 30, then satellite Earth is about 860,000 kilometers from Primary. This would put it well within Primary’s van Allen belts but we can assume that satellite Earth’s own magnetic field would protect the surface from the worst effects of this. Could satellite Earth have its own satellite? If Primary is 860,000 kilometres away, then the satellite Earth-Lunetta centre to centre distance can be no more than 9,000 kilometres, putting Lunetta only 2,600 kilometres above the surface. This is within the Roche Limit so nothing of any size can have an orbit around satellite Earth that is stable over geological time. At best, only small rocks and gravel can be expected. Satellite Earth will revolve around Primary in 120 hours and will likely be tidally locked. Interestingly, despite the presence of massive Primary close by, the dominant cause of tides would be the Sun as the tidal bulge caused by Primary would not move. Occasional larger tides would occur when the inner satellites passed close by. These of course would seem particularly hard to explain to Farside civilisations, who would never see the satellites causing them. Tidal locking also means that the Nearside and Farside skies would be quite different. On Nearside, Primary would dominate the sky, appearing over 18 times the size of the moon as seen from Earth and appearing some 1,600 times brighter. There is room within satellite Earth’s orbit for a couple more moons and these would present visible discs of varying size, depending on distance. At their closest points they could appear the size of Luna as seen from Earth or possibly larger, particularly if they were also of planetary size. It would also be pretty obvious that they were orbiting around Primary rather than satellite Earth and that, combined with Primary’s vast looming presence in the sky, might make it easy for local astronomers to reject geocentrism. On the other hand, most of the time astronomers would see little else. Even on Earth, a full moon drowns out the light from most stars. For most of its orbit, satellite Earth would be receiving orders of magnitude more light from Primary than Earth receives from Luna. The only true night would be a few hours of eclipse once per orbit as the sun passed behind Primary. This would surely greatly inhibit the development of astronomy. On Farside this would not be the case and civilizations located here would spend half their time in darkness, as on Earth. A geocentric view of the Solar System would be even more complex than that developed on Earth because satellite Earth’s revolution around Primary would add the need for an extra epicycle. Such astronomers would never see Primary or the inner satellites and if the only other planets they see are points of light, they might never develop the concept that there could be worlds other than their own. However, it is possible that, just as Primary has migrated to a 1 AU orbit, another jovian could be in roughly the position occupied by Mars in our solar system. At closest approach it would have a magnitude of -10 or more and would be about one quarter the angular diameter of Luna as seen from Earth. Furthermore any large satellites would be visible as bright stars and it would be obvious that the satellites were orbiting their planet rather than satellite Earth. This realisation that there could be centres of revolution other than their own world might make it easier for Farside astronomers to accept heliocentrism. However, satellite Earth’s revolution around Primary would still complicate the issue. Astronomers might postulate a mysterious hidden attractor to account for apparent planetary motions but the proof would not come until the first explorers crossed into Nearside and saw Primary and the inner satellites for the first time. That would be a truly mind-blowing experience. This entry was posted on February 19, 2014 at 4:58 pm and is filed under background for RPGs, Science for role-playing games. You can follow any responses to this entry through the RSS 2.0 feed. You can leave a response, or trackback from your own site.